Do you hold one-to-one writing conferences with your students? Conferring with a student writer is a really effective way to help him/her grow. And holding a writing conference with one student is doable. Energizing even. You feel like you made a difference with that kid. But then, you start doing the math. "Let's see, I just spent 8 minutes with this kid (and it was awesome, productive, all that and a bag of chips). I have 28 kids and about 20 minutes for them to write on a normal day... so at this rate it'll only take me... hmmm... 9,000 years to meet with everyone." It quickly gets overwhelming and you may start wondering, why even bother? I'll just skim the surface of the class as they work, putting out fires, waiting until their writing is finished and turned in to grade and give feedback (even if that feedback is ignored or too late to impact the student). Before you go down that spiral that I know I've been in before, let's take a step back. 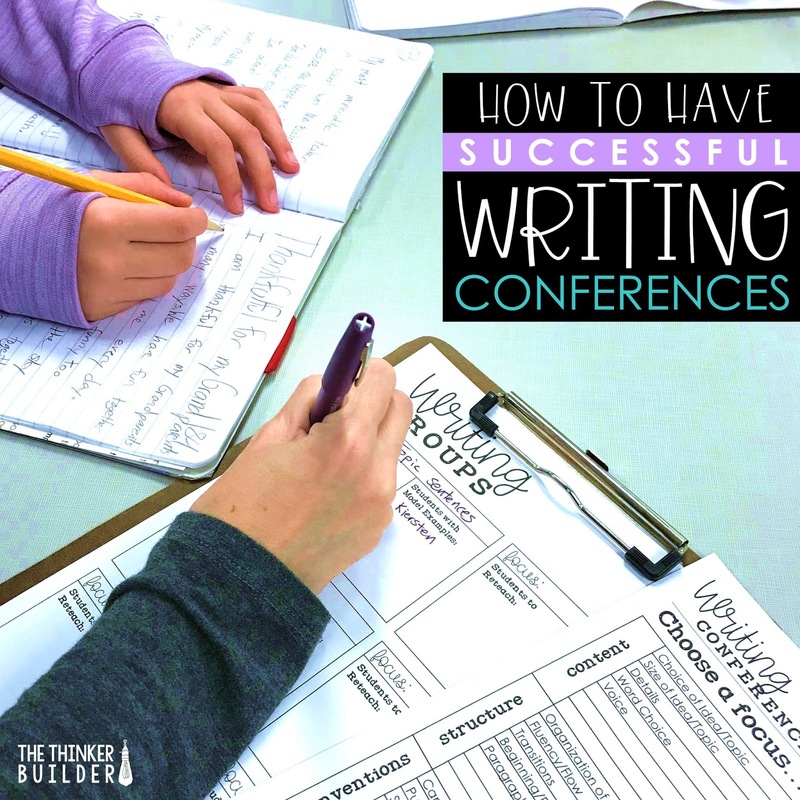 Let me show you some keys to making writing conferences an integral, rewarding (for you and for students) part of your writing block. If we are working with a student, that leaves twenty-odd other students we aren't working with. We've got to be able to depend on them to still be productive so we can focus on helping the student we are with, without distractions or interruptions. That means two big things: (1) gradually building students' writing stamina (we can't just suddenly expect them to write for twenty minutes independently), and (2) having procedures that address common problems that come up, procedures that students understand and follow without us. Consider creating an anchor chart with an "If, Then" framework like the one below. It has a few common issues with example procedures. Note: If you're interested in my revising strategy cards mentioned in the chart above, read more here. If you're interested in my not-your-ordinary story starters, download a free set here. We create the chart together with the class. We ask them what kind of problems come up when it's time to write. We gauge their understanding, and take a few days to practice the logistics if needed. We might even consider wearing a special hat or necklace during our writing conferences, signifying to the rest of the class to not interrupt. But whatever we do, we are laying some groundwork for what comes next. 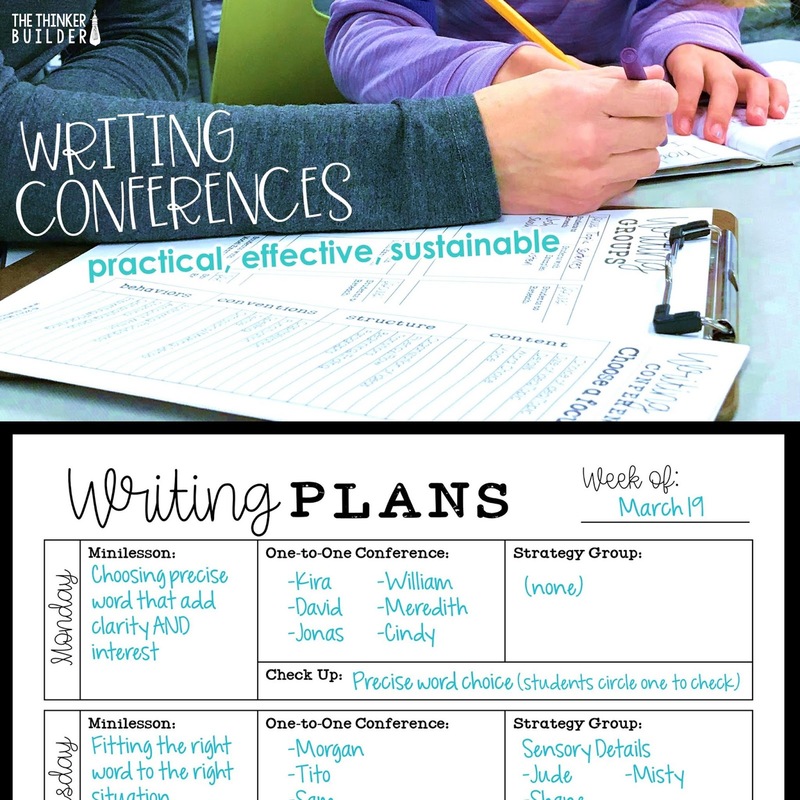 Now that our independent writing time is conducive to meeting with students one-to-one, let's dig into that writing conference itself. It is absolutely unreasonable to consistently hold 8-minute writing conferences... 5-minute writing conferences are tough, too... and so are 4-minute writing conferences. Now, before you start rolling your eyes telling me you'll never get anything out of a two-minute conference, hang on. Let's just for a second assume that you CAN have a meaningful, productive writing conference with a student in two minutes. Okay? If that's the case, what would that allow? If we had two-minute conferences with a class of 30 students, it will only take us four 15-20 minute writing sessions to meet with every student one-to-one. Less than a week to see everybody! That's motivating. Now I need to prove to you that two minutes is enough. That with two minutes, we can scooch a student writer forward. 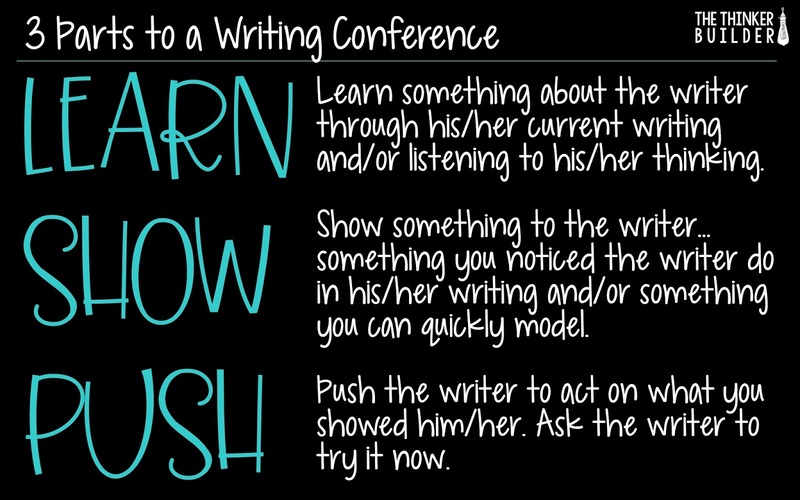 So let's dig into how to have a worthwhile two-minute writing conference. No matter how long a one-to-one writing conference lasts, we need to go into it with the frame of mind to help the writer, not the writing. Now, the student's writing will probably be what we use to help the writer, but if we're only focused on what the student has written, (1) we're going to try to tackle too much (we can't address everything the student has written in one conference! ), and (2) we're going to worry too much about "fixing" things instead of giving the student strategies and coaching that will transfer to future writing. So when we go to have a writing conference, we're going to let go of the desire to look at an entire piece of writing a student is working on, and instead think of it as a resource we will pull from to help the student grow as a writer. 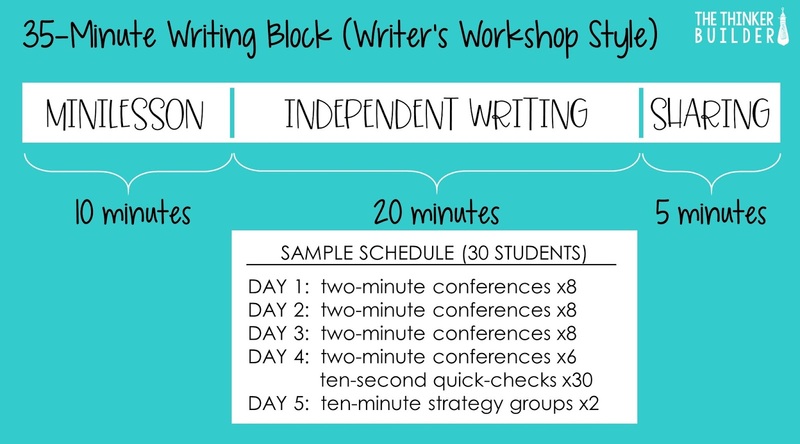 Let's look at the components of a two-minute writing conference now. Because every writer is different, and every piece of writing and the stage at which he/she is working is different, and every teacher's communication style is different, I'm not going to pretend that a magic formula or script exists that works every time. But in my experience, using a 3-part framework of Learn-Show-Push is a simple guide to get started. Now let's take our 3-part framework and apply it to our 120 second goal. How does it really look, from the time before you even sit down with a student all the way through to leaving that student and beginning another conference? First of all, let's make sure we're using simple forms that are conducive to a two-minute writing conference. I prefer to have a form with students' names, with a few boxes, one for each conference to allow me to see several at once. And within each box I can jot down a couple of quick notes, specifically, the date and the main focus of our interaction. You can see in the example above that a simple record-keeping sheet, paired with a quick-reference list of possible focus topics, allows us to (1) keep track of what we are helping each student with so we can build on those things in future conferences, (2) keep an overall sense of who we've met with and how often, and (3) not get caught up in writing down too much, which uses up precious moments we could otherwise be using interact with students. Note: You can have the forms above, plus more that I'll explain below, by signing up for my email newsletter. Keep reading and be on the lookout for the sign-up box. With our simple record-keeping forms in hand, we pull a chair up next to the student with whom we're going to confer. Let's say it's Morgan. How did we choose Morgan? Well one thing is for sure, we didn't make some big elaborate inflexible system. We either glanced down at our record sheet and noticed we haven't met with Morgan for awhile, or we've chosen to have conferences today with all five students who sit at Table Group 3 (thus shortening our chair-dragging distances), or we're simply going in order down our list. And boom... our two minutes have begun. The image below shows the basic layout of our time with Morgan. I want you to keep in mind this isn't meant to be a formula, but I also recognize that it can be really helpful to see exactly how those two minutes might get filled. So let's break down even further what this conference might look like. With the first thirty seconds or so, we LEARN. Can we build off one of these skills, either by taking the skill to a more sophisticated level or by choosing a related skill to focus on? We're also open to a glaring need, unrelated to a recent conference, that we think should be a priority to address and therefore trumps the skills we were focusing on before. What if nothing jumps out at us? 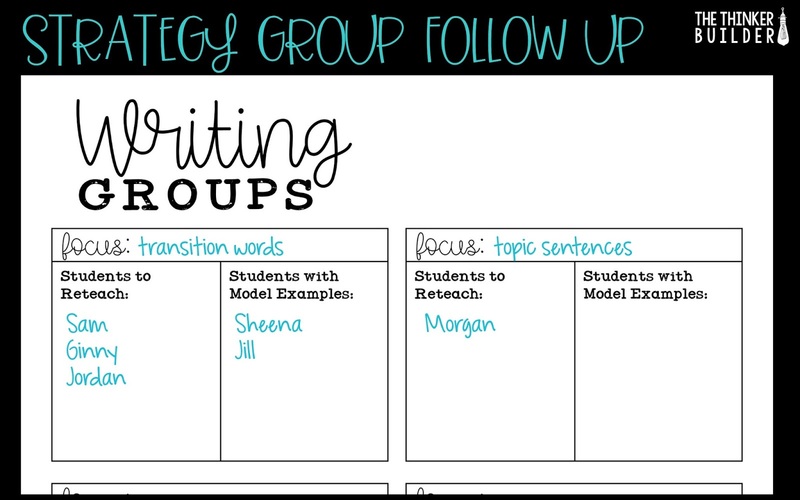 As a default, we'll use the writing skill/strategy we taught in a recent whole-group minilesson as the focus for this writing conference. With the next sixty seconds or so, we SHOW. This is the meat of the conference: the teaching part, the coaching part, the modeling part. We've chosen something to focus on, so let's do it! With Morgan, let's imagine we noticed her attempting topic sentences to begin her paragraphs, but there is clearly some room to grow with this skill. So we're going to first show Morgan what we noticed: "Let's look at this little part you wrote here, Morgan. I see that you included a topic sentence at the beginning of this paragraph. I can tell you are trying to think about that part of your writing. You wrote, 'Cats can take care of themselves.'" Then we model something new for Morgan: "So Morgan, when writers are trying to write persuasively, the topic sentence to a paragraph should do two things, and one of them you are doing really well, which is giving the topic of the paragraph. But let's work on the second thing, which is to really pull the reader into that paragraph. For example, let's say I was writing about how dogs make the best pets, and I have a paragraph about how a pet dog is always excited to see its owner. Maybe my topic sentence started out as, 'Dogs are always excited to see their owners.' Do you see how that's similar to your cat topic sentence? But let's see if we can use this sentence to really hook our reader. I might write, 'You might have friends, maybe even lots of friends, but imagine having a friend that is always excited to see you, no matter what.' What do you notice that's different, Morgan? Do you see how I took my original topic sentence and revised it? I didn't scrap it completely. I used it as a base to build a more intriguing topic sentence." Notice that for this example with Morgan, we modeled using a parallel idea. But we also could have used one of her topic sentences to model a revision. With the last 30 seconds or so, we PUSH. We transition from showing and modeling to giving the student an action step. "So Morgan, take a look at your topic sentence here. How could you revise it to hook your reader into this paragraph?" If Morgan starts revising that topic sentence right away, we observe and simply be a sounding board for her. If Morgan struggles to get started, we might make a suggestion or ask a leading question to help her get the ball rolling. If Morgan stares blankly at the sentence, not sure what to do, that's okay. She might not be ready to make this jump, or maybe she does understand but this particular topic sentence is just stumping her. Again, we might make a suggestion or ask a leading question. Depending on the student and the situation, we don't necessarily need to stay and continue to watch the student work. We leave the student with a closing push: "As you continue writing, Morgan, and you get to a new paragraph, I want you to try to get that new topic sentence to tell the topic AND draw your reader in." Our two minutes have ended. Now we make a quick note on our record sheet. If the student is struggling with the skill, we consider adding him/her to a strategy group to follow up and reteach, noting it on a form like the one below. I highly encourage you to get out your phone, set it on the student's desk, and have the stopwatch running during the conference. It's the only way to really keep the timing a priority. There will be conferences when you think, this student needs more of my time, I can't just whisk along and move on here. I get it, that's understandable. Just remember though, if you do that very often, you're going to be right back where you started in this whole thing. 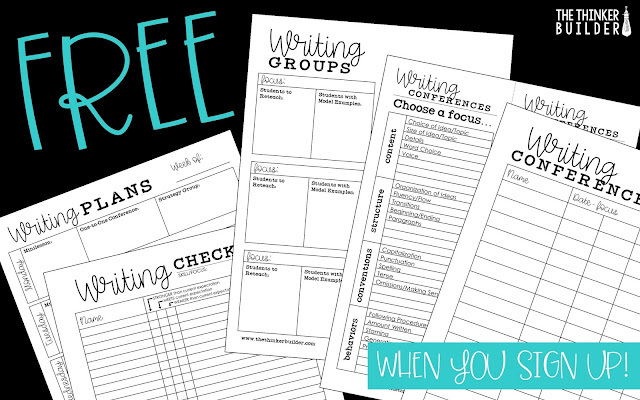 Two-minute writing conferences may be the main interaction we have with our student writers during independent writing time, but it's not the only type we can have. As mentioned earlier, strategy groups fit nicely as a complement to our one-to-one conferences, and help to ease the pressure of trying to do too much in two minutes. When we notice a student who could use some additional guidance or reteaching on a particular skill, we add him/her to a list that we can later meet with as a small group. Still, our strategy group meetings need to be focused and to the point, lasting 5-10 minutes. Sometimes we want to get a "pulse" of the class in regards to a certain writing skill or strategy we've been teaching. So we might do a quick-check, where we ask students to take a highlighter (or marker) and mark a spot in the writing they've done today that shows evidence of this skill/strategy. For example, you might ask students to circle a transition word, or put a star in the margin next to a topic sentence, or underline a sensory detail. 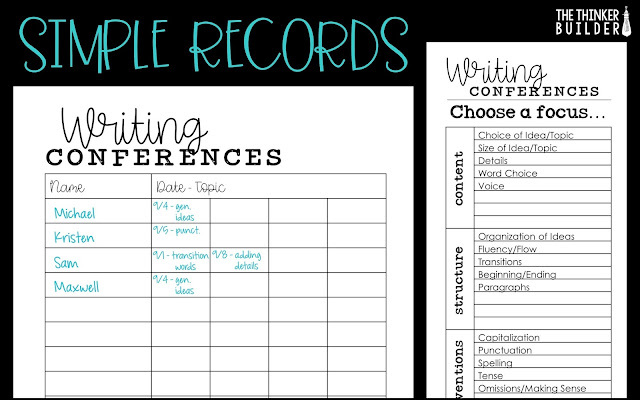 Then you travel around the class and quickly check these marked places in students' writing, making a simple but impactful record. The Check-Up form below works great for this interaction. A quick-check doesn't work for everything, as some skills/strategies we teach in writing are hard to boil down to a single spot to check. It's also worth noting that this type of interaction isn't really a writing conference at all. We barely have time to talk to the students as we are checking because we are trying to get through the whole class in five minutes max. A sort of hybrid between the quick-check above and our standard two-minute conference is a 30-second pop-in. Like the quick-check, we're still looking at a common skill and still having students mark a spot in their writing ahead of time, but here we can take the time to have a short conversation with each student about the skill, make a suggestion or do a bit of coaching. With 30 seconds a pop, we can still make it around to an entire class of 30 students in 15 minutes. 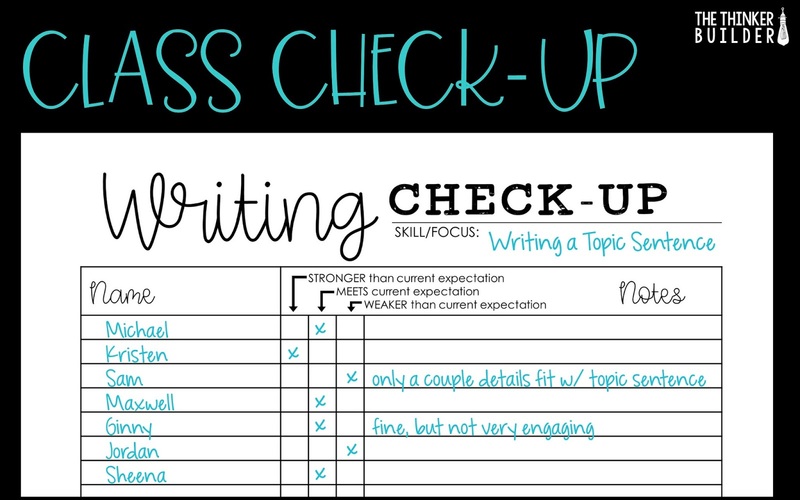 We can use the Check-Up form above and have our strategy group form handy as well for students who "spillover" and need additional help. So how do we meld together all these types of interactions during independent writing? 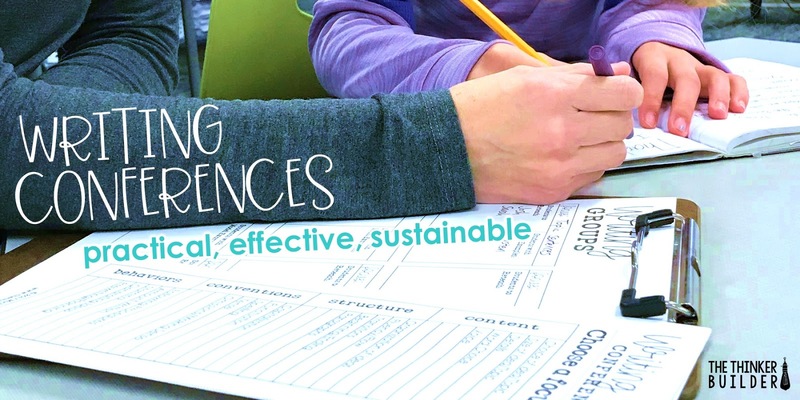 Let's use our two-minute one-to-one writing conferences as our foundation. And let's look at our writing strategy groups as running parallel--we're forming those groups based on our one-to-one conferences. And then we'll use our pop-ins and quick-checks in more of an "as needed" basis, particularly when we want to formatively assess a writing skill/strategy we've introduced whole-group. Let's step back a little further and look at your whole writing block. Improving your system to meet with students about their writing in the vacuum of a single day is one thing, but let's start fitting more pieces together. Particularly, let's think about our independent writing time laterally, over the course of several days or weeks, and let's look at how our independent writing time fits into our writing schedule as a whole. Below is a sample set-up for a 35-minute writing block with a class of 30 students, using a writer's workshop framework where each day includes a minilesson, independent writing time, and a short time for sharing at the end. You can see I broke down a week's worth of the independent writing time to show you an example of how you could interact with your students in different ways. Notice that within one week, we got a one-to-one writing conference with all 30 students, did a quick-check formative assessment of a writing skill on all 30 students, and had two strategy group meetings with small groups. And that's just within our twenty-minute independent writing chunk of our writing block, and usually with time to spare! We can start sketching out a weekly plan on a planning sheet like the one below. With those fifteen minutes of daily writing time, we could have six one-to-one writing conferences a day, every day for a week. 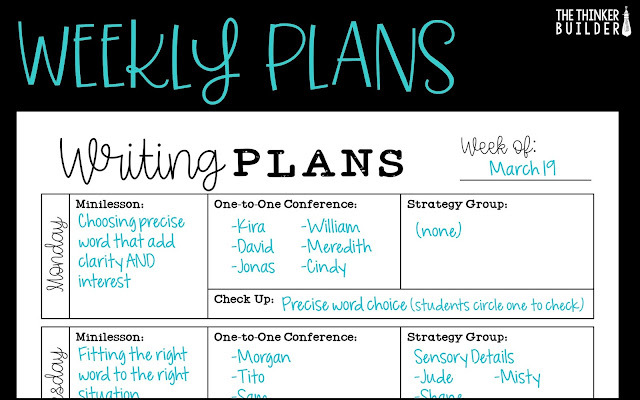 And then the following week, we have strategy groups, quick-checks, and "as-needed" additional writing conferences. Interacting with our students about their writing, more than what we get through whole-group instruction, is so important to their growth as writers. 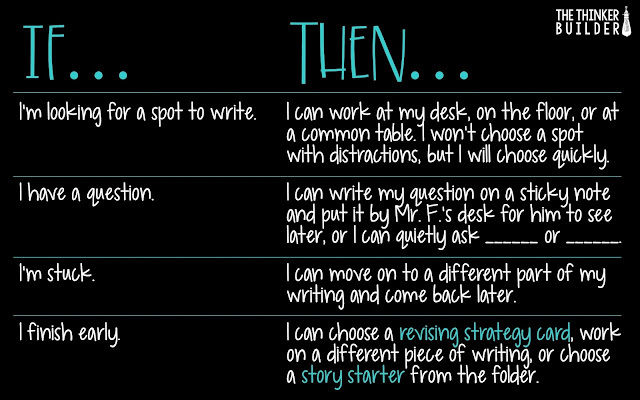 We need face-time, time to be responsive to each student's current needs, and we need some consistency so we can really get to know each student as a writer, and observe and affect their progress. But we need to do it with practicality and perspective so we can sustain it throughout the year.